Irish Garden House: Happy Flower Days . . . Happy Flower Days . . .
wearing wild flowers in our hair . . . Loved reading all those quotes, I must bring out my little book of poems again, xomething to ponder over while resting in the shade. Such vibrant colours of the Zinnias, would brighten any dull day. Lovely quotes and it was great tht you frined brought this beautiful flowers for you. 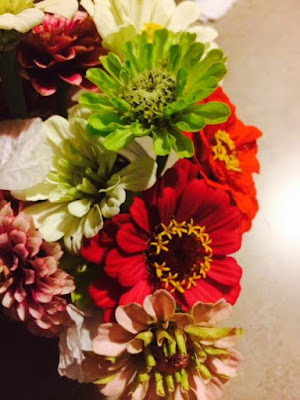 I love the Zinnias and the pretty poem! Your friend Babs is the best! Happy Monday, enjoy your new week ahead! 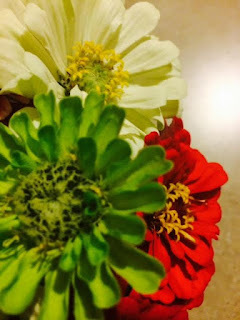 Zinnias are the clowns of the flower world...pretty, fun, bring a smile to one's face. Except I don't like clowns, they tend to frighten me. I do like zinnias though! Love the poem referring to flowers. When I was a teen. I wore flowers in my hair even after I got married. It was a thing to do in my time. It's all just so pretty Lynne, words and photos...they are both dripping in summertime and that makes me smile!! Happy Flowers days to you too! I LOVE the green. The whole bouquet is beautiful and such a thoughtful gift. Beautiful flowers, and lovely quotes. I adore your zinnias... what a sweet gift. 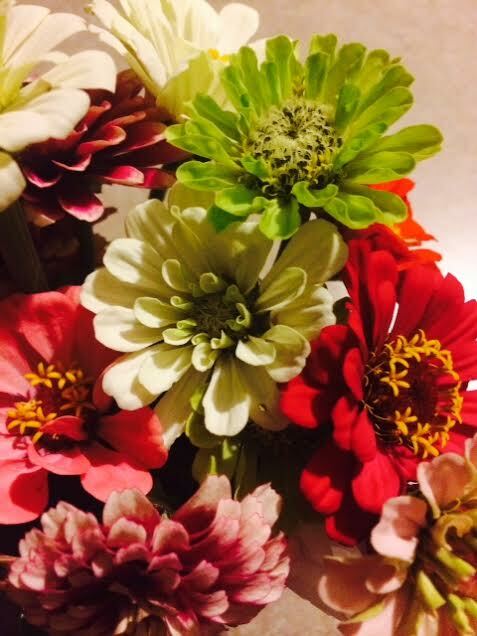 Beautiful, beautiful zinnias! I love the first quote too - it definitely is what you see.